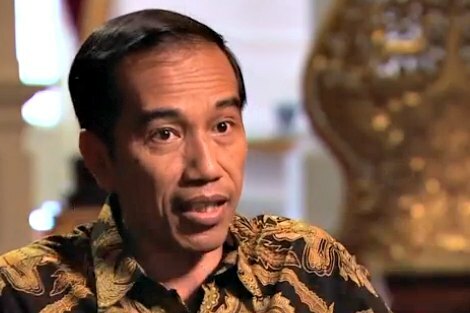 Any faint hopes for a reprieve for the Australians on death row in Indonesia were silently extinguished last week during a CNN interview with President Jokowi to mark his first 100 days in office. Asked by Christiane Amanpour whether his uncompromising stand on the death penalty for drug trafficking meant there ‘would be no relief for the Australians’, the President simply nodded his head emphatically in silent agreement. Andrew Chan and Myuran Sukumaran will now be executed by firing squad in the near future. An unlucky diplomat from Australia’s embassy in Jakarta will be present to witness them shot through the heart at midnight. This latest act of killing will be carried out on a prison island off Central Java called Nusakembangan which translates Island of Flowers, a grim joke given the place’s history as a penal settlement stretching back to Dutch colonial times. The governor of Bali, where the doomed Australians are currently held, has said he does not want them executed in Bali to avoid upsetting the island’s harmony. The one million Australian tourists who visit Bali annually are a staple ingredient of Bali’s economy. Indonesia has had the death penalty on its books since Independence, but has not employed it often. Capital punishment was not practised during Indonesia’s first 24 years and a de facto moratorium has been intermittently in place in recent years. The period 2009-2014 saw only four executions and there were none last year. Even allowing for differences in population numbers, this rate is far lower than in the US and, if I am not mistaken, compares favourably with neighbouring Singapore and Malaysia where the death penalty for drug trafficking is mandatory. Leaving aside Indonesia’s dismal record of state sponsored extra-judicial killings, these figures suggest that Indonesia has been less than enthusiastic, even ambivalent, about the practice of judicial executions. A review of the policy’s constitutionality in 2007 found in favour but three judges dissented and the judgement stated that prisoners who had been on death row for 10 years and had reformed should have their sentences commuted to imprisonment. There has also been spirited public debate since the resumption of the death penalty last month. Haris Azhar, head of the local human rights organisation Kontras, says ‘The death penalty has no place in a modern legal system’. He has publicly debated the issue with proponents, arguing that the death penalty does not work as a deterrent to the narcotics trade and is out of step with global developments in humanitarian thinking and Indonesia’s international responsibilities on human rights as a current member of the UN Human Rights Council. Another respected critic, Jimly Asshiddiqie, the founding head of the Constitutional Court and prolific author, has also labelled the practice anachronistic and criticised the government for inconsistency. Indonesia, he points out, has spent millions defending its citizens on death row in Saudi Arabia and Malaysia but is prepared to execute nationals from other countries. In view of all this, one might have expected the reformist nice guy Jokowi to have opted for abolition, or at least mercy. The opposite has happened. By giving the green light to six executions in January, Jokowi has not only ended this pattern of relative constraint, he has decisively re-instated the death penalty and made its practice a signature feature of his first three months in office. In his CNN interview the President justified his hard line by pointing to the scale of narcotics abuse in Indonesia. Appealing for understanding, he emphasised that a massive 18,000 Indonesians die each year from drug addiction. He might have added Indonesia was not executing addicts but traffickers who exploit their fellow human beings for profit. Public opinion and religion are on his side. Ordinary Indonesians I have spoken too have no sympathy for drug dealers. The death penalty is clearly permitted by the Qu’ran. Jokowi has also shown toughness on other issues that affect the national interest including burning fishing boats trespassing in Indonesian waters, even those from China. He calls it shock treatment. Visitors to Nusakembangan prison are greeted by a sign in Indonesian over the entrance which translates: ‘They are not criminals, just lost people, and it is never too late to repent’. To be executed after you repent, however, is certainly too late, not to mention dumb. It also diminishes Indonesia. But let’s not write Indonesia off. The misgivings mentioned above suggest it too might repent in time. The island is not Nusa Kembangan but Nusa KAmbangan. KAmbang means floating in javanese, while KEmbang means flower. You guys should be thankful your kids are drug-free or just safe at home, unlike those indonesia schoolkids who are the target of int'l drug dealers for the last five years. I wonder if there would be a change of heart if Australians stopped going to Bali? Once again another insightful article, Pat. Indonesia as a nation seems to have the same attitude to the death penalty as Australia as a whole had in the 1950s. I wonder if this is partly due to the rise of Islamoterrorism which most people there seem very concerned about? Do you think Bradley that there would be a change in heart in the US, China, or Singapore if Australians stopped going there? Let's face it, Australia is small beer in these places. Better we focus on our own AFP which gave the Indonesian authorities the tip off, and is still doing so, regardless of the potential outcome. It's time for Abbott and Brandis to act, but don't hold your breathe. Thanks Pat for assisting with the context for this most confronting issue. I have my fingers crossed that mercy will be granted and that the judiciary will demonstrate independence from the government. Indonesia or some Indonesians seem inconsistent and unrelentingly tough at the same time. However Australian authorities knew this when it is alleged they knew the consequences and let the dealers go into the arms of the Indonesian authorities. There are credible suggestions the AFT and their masters could have stopped these guys leaving Australia. Funny how we focus on the Indonesians. When I studied Apologetics at a Jesuit school in Australia in the 1950s I was taught that preserving the common good of society could sometimes justify the killing of an aggressor. It was the right and duty of those in authority to punish wrongdoers by means of penalties commensurate with the gravity of the crime. This did not exclude the death penalty where the aggressor's crime was considered extremely dangerous to the common good. .As adolescents and naive Christians we asked 'What about tempering Justice with Mercy?' 'Ah,' were told, 'I take refuge in the words of Henry Fielding "Thwackum (the personification of letting the punishment fit the crime) was for doing justice, and leaving mercy to Heaven.' Not a very helpful answer but it did introduce me and several of my friends to Fielding's novel Tom Jones. President Jokowi is no Thwackum but I think he has reasonable grounds for regarding drug dealers as a moral and mortal danger to his country and if the law permits them to be executed, I can understand why he is not inclined to overrule the judiciary. Maria, where do you get the idea that this is all because the judiciary is not independent of the (executive) government? Would you say the same about our High Court because of its recent judgement in the case of asylum-seekers from the sub-continent? Instead of wringing our hands over a 'backward' Indonesia, we should be asking questions about our own AFP and the Ministers who oversee it. "What is hateful to you, do not do to your fellow: this is the whole Torah; the rest is the explanation; go and learn"
I certainly do not believe in the death penalty, anywhere. However, Indonesia is an independent sovereign nation, and we have no right to interfere or preach them about their governing. It is tragic, but those two men KNEW exactly what they were doing, and did it. It is the Australian Federal Police which deliberately got it wrong. They knew too, before the Indonesians, and should have arrested them all here. If Indonesia is serious about stamping out drug trafficking through its territory, perhaps it could stay Sukumaran and Chan's execution for so long as no further breaches of Indonesian drug-trafficking laws by Australian citizens? The deal would be, so long as all Australians respect Indonesian law, Sukumaran and Chan are permitted to continue their advocacy in Kerobokan - but their lives are forfeit if any Australian ever again insults Indonesia by trafficking drugs through its territory. By implication, it would also mean that Sukumaran and Chan stay alive through the choice and actions of so each and every Australian person. Tony Abbot is on the record stating that he's made pleas to Indonesia for clemency, but not in any way that would hinder Australia's relationship with Indonesia - in other words he won't bring out the political big guns. I wonder what a Labor government would have done, considering they created a political stalemate with Indonesia to protect the welfare of our live cattle. I truly believe if the two gentlemen on death row were white/anglo/celtic Australians, our government would be raising hell to save them. Everyone knows of Indonesia's stand on drugs, and how serious of a crime it is in the country. And yet these people still chose to break it. Whose fault was it but their own? If the Law clearly states death penalty for drug smuggling, then death penalty is what you're going to get. You commit a crime, you have to pay for it. Simple as that. I will never forget that Indonesia killed one of ours when it is not necessary. I will never be happy to donate to that country again. David Arthur's comment reminds me of the miracle of the multiplication of bread and fish Jesus performed to feed 10,000–20,000 people or more. How much future good could come from his suggestion of mercy and goodness. In many ways, this fits the rest of the President's politics. He ran for the presidency as an economic and social populist. Just as we frequently see in most western countries, including Australia, populist politics has included a hairy-chested approach to issues of law and order.